In the time it takes you to read this post, you could have this Refreshing Hot and Cold Tofu ready. With clean, zesty flavours this wonderful dish looks a little fancy, it’s the perfect no-fuss dinner party entrée, but is simple enough for everyday. “Note to self: None of us is getting out of here alive, so please stop treating yourself as an afterthought. Eat the delicious food. Walk in the sunshine. Jump in the ocean. Say the truth you are carrying in your heart like hidden treasure. Be silly. Be kind. Be weird. There’s no time for anything else” (Nathan Hoffman). 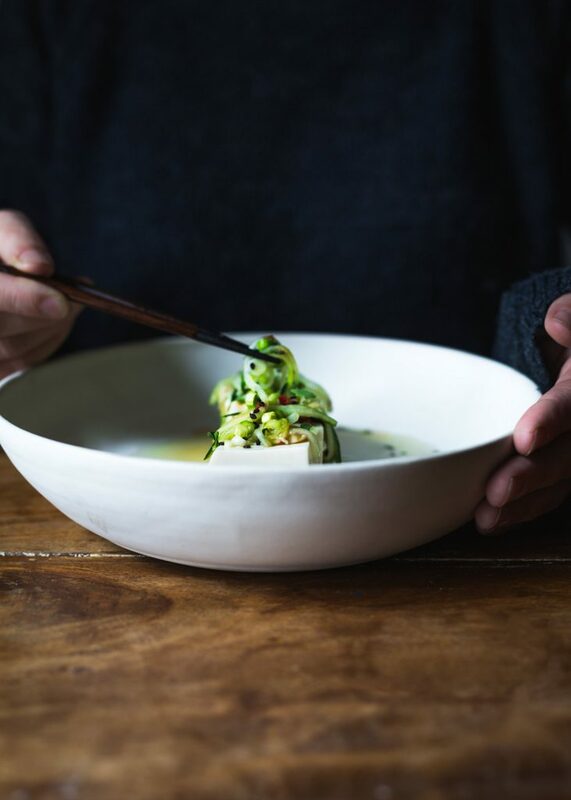 I had planned a new kid-friendly sneaky recipe with hidden vegetables for today’s post but after eating this wonderful bowl of cool silken tofu with cucumber and warming ginger, garlic and chilli, I had to share. Sometimes us adults just need to make something for ourselves that has nothing to do with the kids. 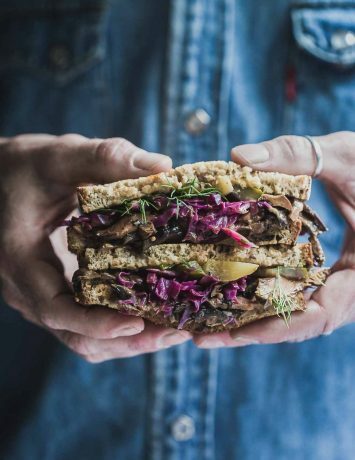 This Refreshing Hot and Cold Tofu is quick and simple with just enough spice and zest to make it an exciting lunchtime alternative to the humble sandwich. If you love asian flavours, you are going to love this. 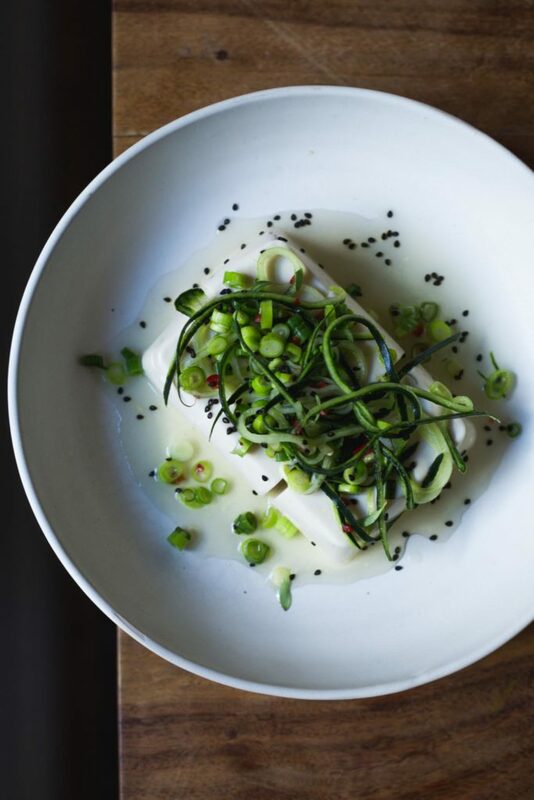 While I love silken tofu, it’s the vibrant flavours of the combined cucumbers, spring onions and chilli with tart vinegar and sugar that makes this dish sing. Add fresh ginger and garlic to the blend and you have a gorgeously balanced, complex spoon of deliciousness. This wonderfully fresh blend could just as easily dress a seaweed or kale salad and would work perfectly over cold soba noodles. The colour just screams goodness, I love it. A kid-friendy sneaky vegetable recipe is due but sometimes, make that always, it’s as important to fuel your own body and soul. 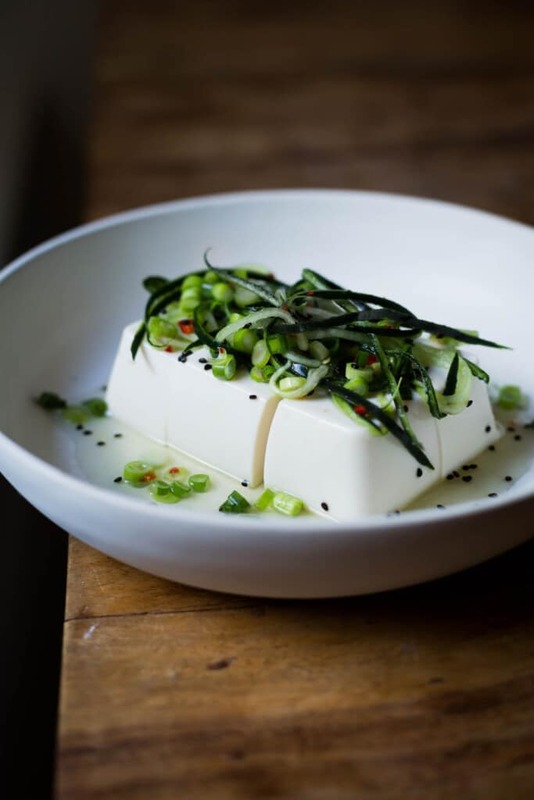 This Refreshing Hot and Cold Tofu is a little something can be whipped up in no time at all; guilt free and utterly yum. I don’t care that the Elf wrinkles her nose up at it (too spicy); in fact, I am pretty happy about that. I wasn’t planning on sharing anyway. Enjoy. 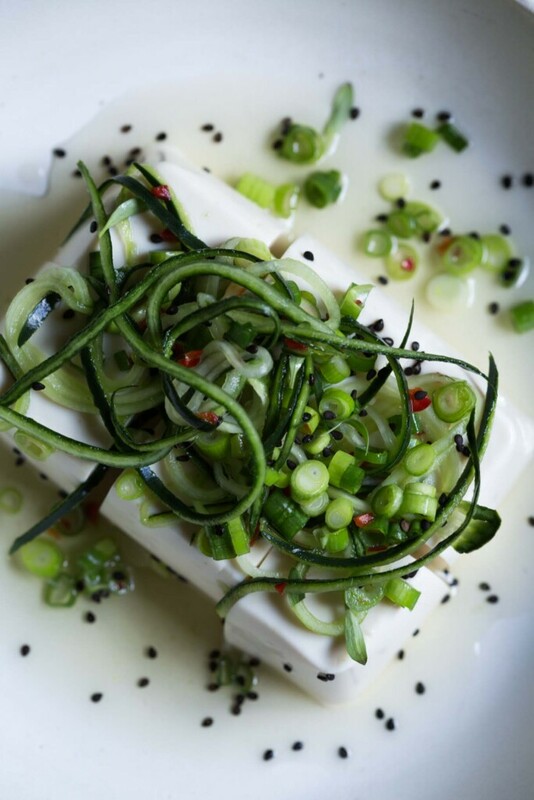 Chilled tofu served with a zesty cucumber dressing, this Refreshing Hot and Cold Tofu is a wonderful combination of chilli heat and cool textures. Gently place the silken tofu on a kitchen towel to drain. Either thinly peel or julienne the cucumber in to long ribbons. Alternatively you can grate the cucumber. Put the vinegar, water, sugar, garlic, ginger and salt in to a small saucepan and bring to a soft boil. Reduce the heat and cook for 3 three minutes until the sugar has dissolved. Remove from the heat and allow to cool for a minute or two. 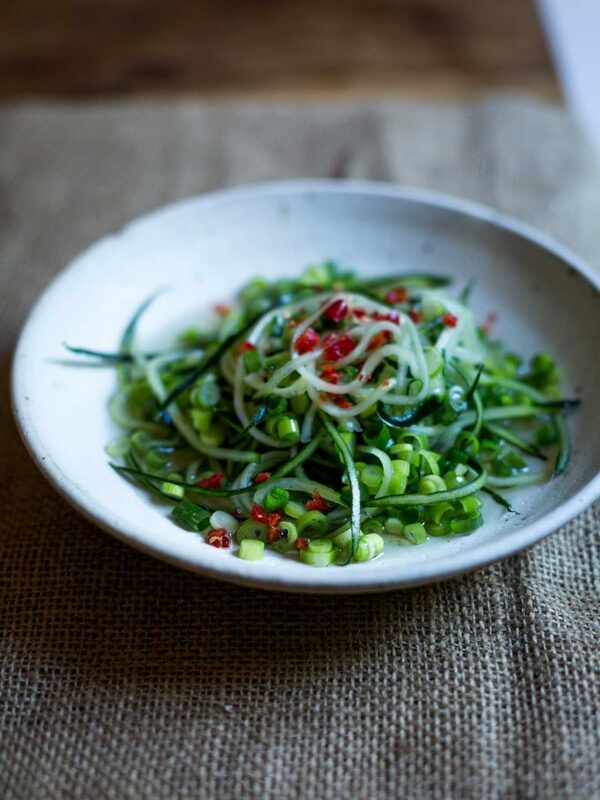 Place the cucumber and onions in a small bowl and drain the dressing over the top, discarding the garlic and ginger. 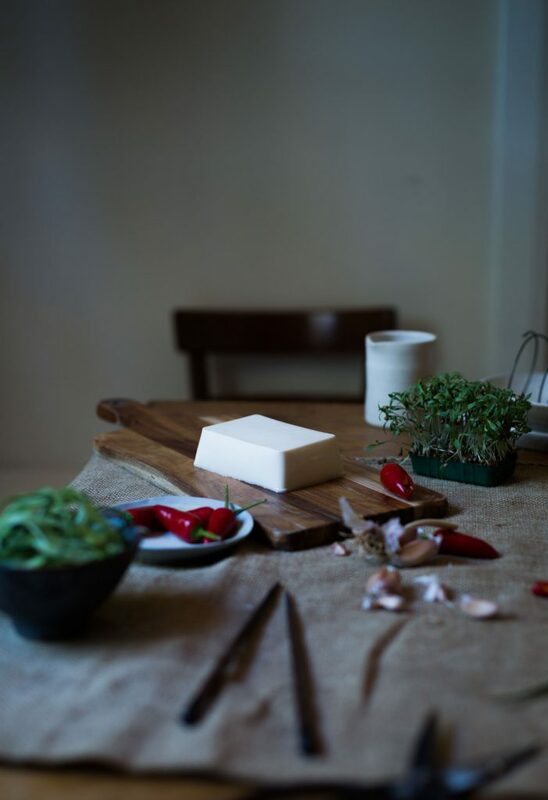 Add the chilli and sit while you cut the tofu. Gently slice the tofu in to 6 even cubes. Place all the cubes in to a bowl or three cubes into two bowls if serving as an entree. Spoon the cucumber dressing over the tofu making sure to include a good amount of cucumber, onions and chilli on top. Serve with a tiny drizzle of soy sauce, sesame oil and a smattering of black or sesame seeds.